This postcard posted in 1907 and published by Russell & Sons of Baker Street London, shows Edward Stuart Talbot, first Bishop of Southwark. Bishop Talbot was born in 1844 the son of a QC. He Studied at Charterhouse and Oxford and was ordained at 26. He was a follower of the Oxford movement, and acknowledged the Tractarians as his spiritual fathers. He was 1st Warden of Keble College and Bishop of Rochester in 1895. 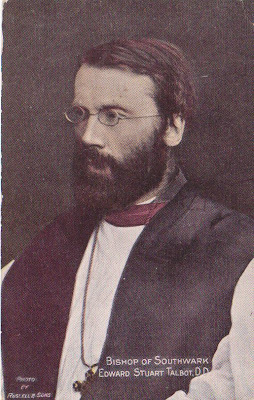 He organised the creation of the Diocese of Southwark in 1905 by splitting the extensive Diocese of Rochester. Southwark was to include the county of London south of the Thames and East and Mid Surrey. He became the first bishop of Southwark from 1905 to 1911, and then Bishop of Winchester for twelve years until retirement.